Great Western Transportation is your complete trucking service! We excel with the best resources in Full Truckload (FTL) and Less-Than-Truckload (LTL) Trucking. We handle the movement of Dry Freight, Refrigerated Freight (chilled, frozen and temperature controlled), Flatbed Freight (standard, over-dimensional , and overweight), Heavy Haul Freight (no job is too big or too small), Power-Only Trucking (single and team driver service available), and Trade Show Trucking (complete service available). One of the main advantages of using Great Western Transportation is the network that we have in place to give you expedited transit times at very competitive pricing. Dry Van Trailers, Refrigerated Trailers, Stepdecks, Flatbeds, Dropdecks, Lowboys Double Dropdecks, RGNs, Extendable Flatbed and Curtain Side Trailers. Our Staff: Our Great Western Transportation team has more than 100 years of combined trucking experience within the LTL Trucking and Full Truckload industry. We specialize in the Flatbed Trucking, Refrigerated Trucking, Dry Van Trucking, Heavy Haul Trucking and Power Only Trucking areas. Flatbed trailers are the best way to transport loads that are impossible or impractical to transport in a regular enclosed dry van. Examples of flatbed freight include: large equipment, building materials and large machinery. Flatbeds allow for greater dimensional flexibility, which makes them the best and the safest choice for these types of large or heavy loads. 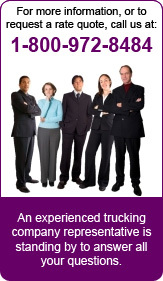 We can handle all of your “less than truckload” (LTL) shipments and of course full truckload shipments. Flatbed trailers may be utilized in several ways, and can accommodate almost any type of freight. The advantage of a flatbed trailer is that it may be loaded from the sides, the top, or from behind. Being able to load from any direction makes flatbed trailers the most versatile trailer, when it comes to transporting your oversized equipment and cargo. There are numerous options that exist for shipping flatbed suitable freight. You will have the advantage of our team’s reliable experience when choosing a particular trailer type and services best suited to transport your freight. Over sized, over dimensional or over weight shipments may be moved on a flatbed, if the shipment can’t be broken into smaller parts, but freight over 8’6” W is considered over width and requires special permits. Freight over 11’6″ wide will also require a Pilot Vehicle Operator (PEVO) in most States. A PEVO is a special car with flashing safety lights and/or height poles that leads the shipment on the route from the starting point, to the destination for the safety of the public and the freight. Generally, over width shipments can only travel during daylight hours, therefore, take into account that your transit time may be effected or extended when shipping an over width shipment or over dimensional load. An RGN is used for moving heavy equipment and has a variety of other uses. The RGN is also known as a Lowboy and a Double Drop Deck with detachable deck. The name of this trailer describes its main feature: the neck of this trailer will detach allowing the front of the trailer to become a ramp that can be driven onto. Overweight loads are often transported with an RGN that has additional axles, since it has the ability to transport freight weighing over 100,000 lbs. A Step Deck trailer, also known as a Single Drop Deck is very similar to a standard flatbed trailer. However, these trailers are ideal for moving equipment that would push a regular flatbed over height. Step Deck trailers can carry freight up to 10’6” high, compared to 8’6″ for a flatbed. Step Deck trailers are also useful with ramps to load equipment that can be driven onto the trailer. Flatbed and RGN Stretch are simply trailers that have the ability to transport extra long loads. These trailers have all the useful advantages of a flatbed trailer, but are more tailored to over dimensional loads. A Double Drop Trailer, or Double Drop Deck, has an upper deck in the front and a deck in the rear. The middle of the trailer is often referred to as the well. These trailers are useful for transporting over height loads because they can carry freight up to 11’6″ high. They are similar to an RGN except that the front deck doesn’t detach from the rest of the trailer. Specialized Trailers like the Double Drop are used for many different types of equipment. These types of trailers are used when the standard trailer type may not be used. Many of the specialized trailers are designed for specific equipment or over weight and dimensional issues. A Side Kit Flatbed is a 45′ to 48′ flatbed with 4′ removable sides. Used extensively in the steel industry in cases where overhead cranes are used for loading. As our trusted customer you will have access to flatbed capacity anywhere in the United States and Canada. Great Western Transportation can provide an assortment of equipment types and sizes along with any necessary components such as Conestoga covers, tarps, straps, chains or coil racks. We understand that requirements differ for each customer, so feel free to contact us regarding any questions. We will provide you a stress free solution for basic flats, step decks, double drops, RGNs, maxis, over dimensional, overweight, expedited, and flatbed LTL or truckloads, as well as the required applicable permits and pilot car services. Great Western Transportation will coordinate the logistics for even the most challenging shipments your company may need delivered in a safe, timely and cost competitive manner. When a flatbed trailer is insufficient due to the shipment being too tall, wide, or heavy; a heavy haul trucking method is your only option. In the U.S. a superload is a truck tractor with an attached trailer that has an over dimensional and/or over weight object (the load) on it that exceeds the ordinary permit limits commonly associated with oversize and overweight loads. Both the size and weight of a superload are regulated by the State the load is moving in and are different depending on which State that is. An oversize load (including tractor and trailer) may exceed the standard legal dimensions of 13′ 6″ in height and 8′ 6″ in width (the length varies by state). The load must be non-reducible (cannot be reduced to legal dimensions). An overweight load must consist of a single unit to be shipped that will exceed the total legal gross weight of 80,000 lbs for the truck, trailer, and unit shipped. Great Western Transportation will manage the transportation of your superload shipment from start to finish. Including obtaining special permits for each state and county requirement, pilot cars or other safety vehicles and any additional equipment required to move your heavy haul load in a safe manner. As a reminder, “Less Than Truckload” shipments or full truckload shipments, we will accommodate both! Whatever you need to transport, Great Western Transportation has hauled it before and has the necessary expertise to make your freight shipment a cost effective success. With our online freight quote system, you can quickly get a rate for any heavy haul loads (during regular business hours).